January, 1900 marked the beginning of a new century for America and the atmosphere was one of hope, challenge and prosperity. 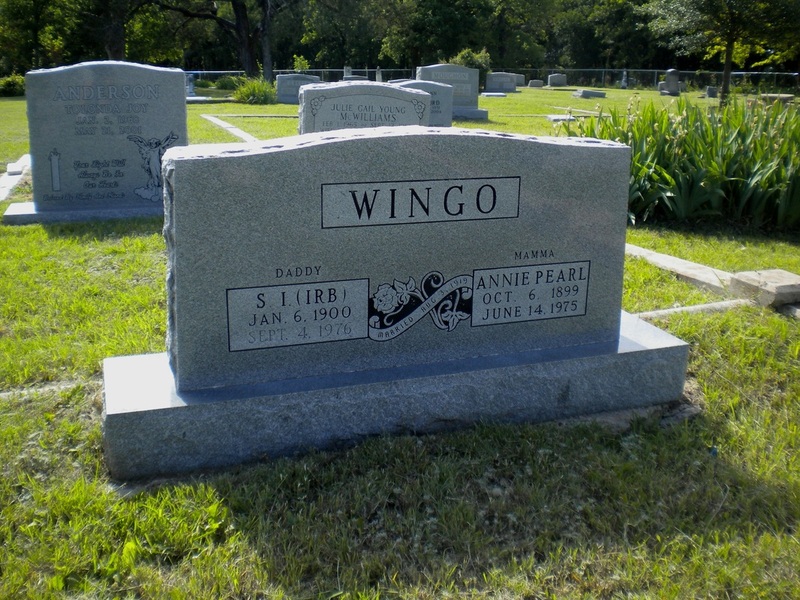 Six days into this new era was born Stephen Wingo (1900-1976). The second child of Stephen Obediah Wingo (1836-1930) and Mary Alice Bean (1876-1951) followed in his father’s footsteps and eventually took up blacksmithing in Weatherford. In 1919 he married the pretty Annie Pearl Newberry (1899-1975) He proudly bought a house and property on Liberty Street for his new bride. They both resided there until their respective deaths. Just as his birth heralded a beginning, his death marked an ending. In this case his death marked the ending of a dying craft in Parker County. He was the last practicing blacksmith in Parker County and people came many miles for his valuable skills in repairing needed equipment. A first-born son, Stephen Jasper arrived on July 17, 1920. Proudly his father watched him grow and realized that his son had not only his name, but his features and a great skill with his hands. He later became a gifted carpenter. On Halloween night 1914 he and Sarah Barnett (1923) decided to give themselves a life long treat and become man and wife. They have five children: Sara Jean (1944), Lillian Rebecca (1945), Larry Stephen (1955), Brenda Kay (1957), and Scot Alan (1958). The second child, Stephen Irvin Jr. (1921) also inherited his father’s manual skills and became an auto body repair expert. In 1943 he married Katherine Fay Morgan and they had two sons, Irvin Ray (1945) and Rodney (1948). In 1949 he married Ruth Melkin and they had six children: Karen Ann, Wayne, Linda, Robert, Stephen and Dorothy. On February 15, 1964 he married Willa Kinery. They resided in Mesquite where he has his own body shop. The third child, Robert (1923) moved to the land of opportunity, California, after World War II. He and his bride Sybil Huckabee raised a family of four: Charlie Huckabee (1939), Buck Allen (1943), Robert Wayne (1948-1970), and Peggy Lee (Carson) (1953). “Bob” is now a building superintendent; previously he operated his own plumbing company. With the arrival of the third child on February 1925, the first baby girl; Mildred Lee, was born to the family. In 1946 this young nurse married Frank Kelley, a medical equipment expert. They also reside in California and have two sons: Mike (1950) and David (1955). The fourth child, Dorothy (1927) started her career for the Missouri and Pacific Railroad. She now serves as a chief payroll clerk. She married Cecil Anderson in 1949 and they had two girls: Mary Nell (1950) and JoAnn (1951). On May 3, 1974 the family assembled to watch Dorothy join Roy Lewis Fogo in holy matrimony. The fifth child, Charles Glenn (1931) married Ginger Fross in 1952. With their two children, Randy (1953(and Sherrie (1954), they have worked to preserve nature in both California and Alaska. They currently reside in Pearce, Arizona and maintain a ranch in Belize. In the spring of 1934 the couple had their sixth child, Joyce Ann. She inherited her mother’s deep faith in God and love for humanity. She served as a missionary before marrying Ken Ledlow in 1967. They currently reside in Mississippi and have two children: Dallas Lee (1972) and Amy Suenme (1976). The seventh child, Ben Wayne, (1936-1938) died as an infant. On February 1939 the baby of the family was born, Ina Sue. In 1958, she married Davis Ray Young. Ina Sue has always lived in the Weatherford area. Her husband owns Young’s Service Station on North Main. Since graduating with her M.A., Ina Sue has taught in local schools while doing further graduate work. She and Davis have four children: Jenny Ann (1960), Julie Gail (1965), Paul Edward (1965) and Kelly Ray (1967).